THIS IS A NECESSITY IN CAMP OR OUT IN THE WILD. When you're eating around the campfire at night, under the stars and moonlight, you have to be able to illuminate your food and eat at the same time. A flashlight doesn't work well for that — you need two hands to eat and one hand to hold a flashlight. 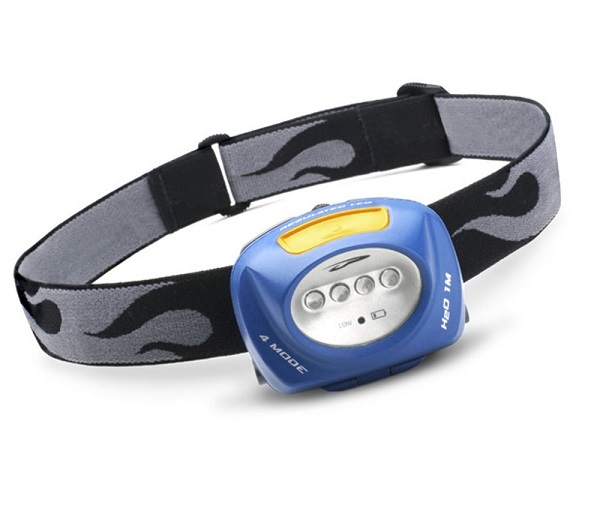 The headlamp is the perfect answer for this and other nighttime maneuvers. A single switch gives you four light modes: low, medium, and high brightness settings and a high blinking mode. Waterproof to 3.3 feet (1 meter). The Quad is a lightweight powerhouse — only 3.4 ounces (96 grams). The head rotates 90 degrees to light things from the book in your hand out to 80 feet (24 meters).